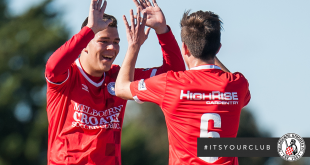 A 90th minute winner from Tomislav Uskok has sent Melbourne Knights clear at the top of the table as they edged Dandenong Thunder 1-0 at Knights Stadium on Friday night. The captain popped up with his second goal of the campaign when he eventually found the net following mayhem in the Thunder penalty area from a corner kick. Goalkeeper Zaim Zeneli, who had kept his side in the match, could only help the low strike into the bottom corner as the goal cued joyous celebrations. 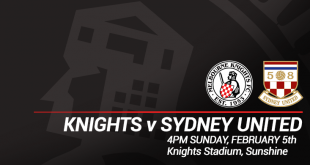 The home side took a while to get going and it was James McGarry’s 15th minute free kick that drew the first save out of Zeneli, as he dived to parry the shot and was fortunate that the rebound just eluded the Knights attackers following up. The best moment of the half came midway through the opening period as Alex Dao bent in a pinpoint left foot cross which Andrew Barisic met with a diving header that bounced inches wide of the target. 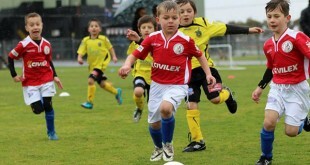 The sides went in even at half time and the start of the second half was also a cagey affair. Dao’s deep free kick on the hour mark bypassed everybody in the box and almost beat Zeneli, who just reacted in time to make an awkward save. The best chances yet came in quick succession in the 77th minute. First, Barisic got the ball out of his feet and whacked a low shot across Zeneli that looked destined for the corner before the keeper made an impressive diving save. The ball went out wide and was crossed in to Stipo Andrijasevic, but the attacker could not direct his header on target. The Thunder could even have taken the lead three minutes later with their best opportunity of the match, as Michael Gerace tested Chris May with a powerful strike but the stopper was equal to it. A flurry of chances came late on as Andrew Marth’s men pushed for the winner. In the 89th minute Zeneli made a fantastic double save to deny first Andrijasevic and then Barisic. In the same sequence of play, Andrijasevic’s acrobatic volley was tipped over the bar by the busy keeper. 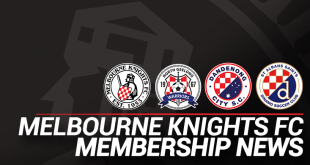 That presented the corner kick which led to the Knights’ winner and put them in outright first position as Bentleigh Greens and South Melbourne drew on the same night.